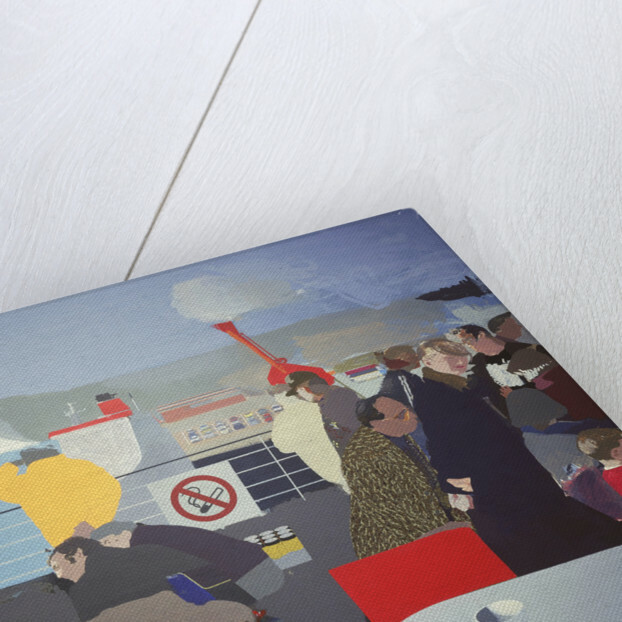 The 'First of England' is a large-scale oil commission of 1998 based on sketches and photographs taken by the artist during various ferry trips around Britain. 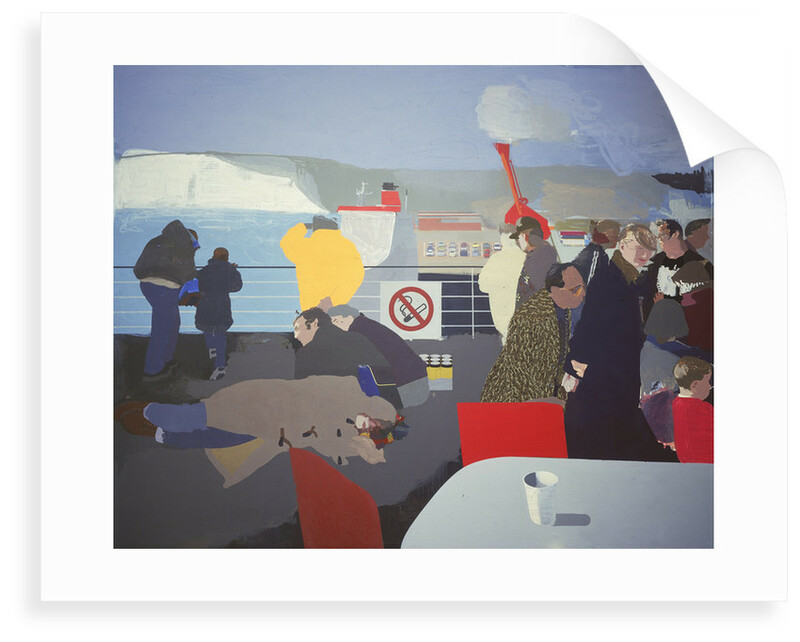 Asked to paint a picture of modern maritime Britain he turned to his perceptions of people travelling on a ferry. Ocean saw parallels with eager day trippers being conveyed back to England from a shopping trip in France and Philip Larkin's description of troops in WWI being shipped over the France. Furthermore he saw the experience of travelling on a ferry as a common one, serving as an extension of the car as well as being a floating high street. Humphrey Ocean's painting comments on the significance of sea travel for the British today, and portrays an unromantic image of the relationship of Britons with their coastline. This scene on the English coastline gives the impression of individuals living seemingly isolated and disinterested existences. 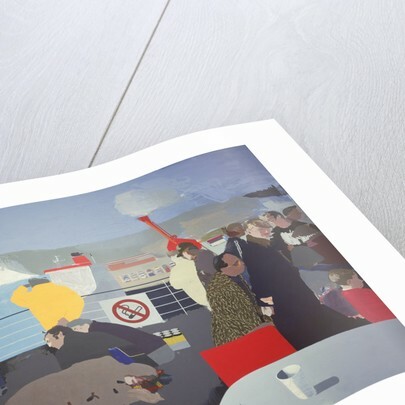 The setting of the ferry arriving at Dover offers a sense of movement though most of the people portrayed appear disinterested in their surroundings. Oblivious to each other, they behave with characteristic 'English' nonchalance. No one looks at the figure lying on the bench, not caring if he is drunk, dead or just asleep. 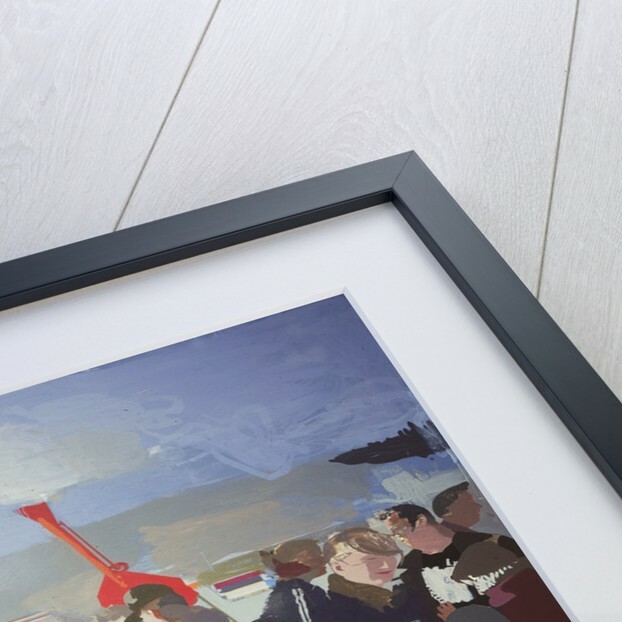 In the tradition of post-war British pop art, the artist is able to select an object that symbolises a particular experience or collective memory. The polystyrene cup sitting in the emptied out foreground captures the resignation of drinking stale coffee, whether on a ferry or at a roadside cafe. He uses blocks of colour to convey the mood in an image where the totemic white cliffs are still able to claim dominance. More by the artist Humphrey Ocean.